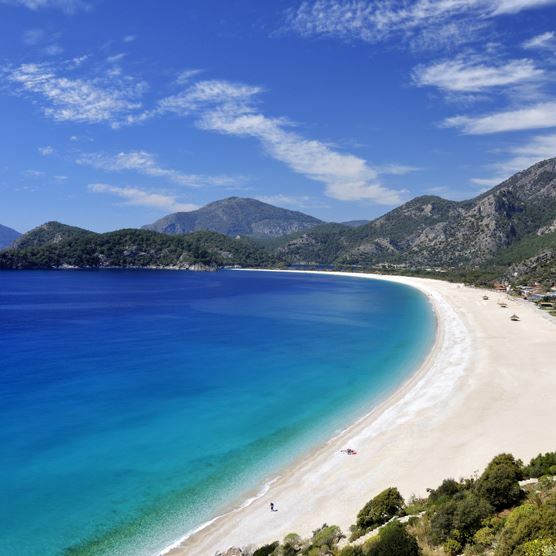 Sitting on the Mediterranean coast of Turkey is the idyllic resort of Olu Deniz. It's located amid a vibrant valley and backed by pretty pine tree hills and serves up some of the country's most premier beaches including the beautiful Blue Lagoon - famous for featuring on many a postcard. Once you've seen all that this spectacular village has to offer, why not hop on a boat and indulge in an array of tourist attractions during your fun family holidays? Travelling to the Turqouise Coast but not sure where to stay? Take a look at our top holiday resorts in Turkey and find the perfect location for you. This sophisticated excursion is definitely suitable for anyone who wants to sunbathe, chill out and relax, while swimming in crystal-clear waters. Boat trips leave from the main beach every day during summer, and their first stop is Butterfly valley, a snorkelling utopia. Other places worth a visit include the famous Gemiler Island, otherwise known as Saint Nicholas ruins, and Camel Beach. Lunch is included on all of the trips and sun protection is a must during your Turkey holidays. This exciting day trip is perfect for culture vultures, combining the natural appearance of Saklikent gorge (the largest in the Mediterranean) with the historical richness of the ruins of Tlos, an ancient city displaying Lycian, Roman and Ottoman architecture. It's mostly renowned though for its Lycian rock tombs standing at the top of the hill, and overlooking the scenic Xanthos valley. Lunch is eaten at Yakapark, a famous trout farm high in the hills. If you consider yourself a bit of an adrenaline junkie, then a jeep safari tour is a super way to spend an afternoon. Take a seat in an open top jeep and escape the tourist face of Turkey as you venture into rural mountainsides, small traditional villages and hidden scenes of natural beauty. Once you've lapped up all that the vibrant landscape has to offer, end the day on pretty Patara,Turkey's longest beach stretching for an impressive 9 miles! Head to Fethiye, jump on the Ferry that travels to Rhodes island and explore the ambiance and character of this famous Greek Isle. The old town has a magnificent medieval fortress that was built by the crusaders and within the winding cobbled streets you'll find small boutiques and quaint old shops. Don’t forget to find a good café or restaurant and indulge in a traditional Greek meal, too. Olu Deniz and Fethiye are scuba diving havens thanks to their crystal-clear waters and underwater sea life. This activity is suitable for beginners or experienced divers but if you prefer a birdseye view of the Mediterranean sea, paragliding from Babadag Mountain is a must. Wind conditions have made Olu Deniz a paragliding hotspot and it is not unusual to see about 20 para-gliders in the air at the same time! If you don’t mind traveling the distance, there are plenty of places worth visiting in the surrunding area. The white calcium pool of Pamukkale (otherwise known as cotton castle) are breathtaking if you fancy taking a dip in its mineral rich thermal waters and along with the ancient ruins of Hierapolis, it's also a UNESCO world heritage site. Closer to Olu Deniz is the mud baths of Dalyan and the famous turtle beach, both making a briliant day out. A highlight of this excursion is sailing the reed lined river overlooked by the Lycian rock tombs of Caunos! The nearby region of Fethiye is definitely worth exploring for its diversity. It has a large market on a Tuesday and the old town near the harbour is home to some quirky shops and bars. Lovers of freshly caght seafood should visit the fish market, where you can choose your lunch and a nearby restaurant will cook and serve it with fresh salad. Hunt for some history and seek out the old amphitheatre, museum, and if you are active, the majestic rock tomb of Amynthas high in the hills and overlooking the region! The nearby village of Kayakoy, (formerly called Levissi) was home to thousands of Greek orthodox citizens until the population exchange of 1923. Over time, the village was deserted by returning Muslims and it is now the largest abandoned town in the continent of Asia Minor. Explore ancient old churches, abandoned homes and empty schools, and when lunchtime rolls around, settle down in one of the nearby restaurants for some juicy lamb tandir!